The State of North Carolina has implemented the North Carolina Hazardous Chemical Right To Know Act, effective since May 25th, 1986, which is intended to be used by employees, employers, citizens and emergency responders to inform them of potential hazards, regulations, responsibilities, and their rights regarding hazardous chemical storage. Chemical storage regulations and requirements vary throughout the nation and are constantly changing throughout federal agencies such as the EPA, OSHA and NFPA. Different types of chemicals have different regulations, depending on quantity, the type of chemical being stored and its uses. 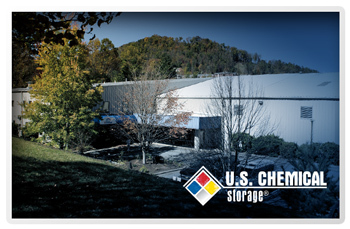 It is our goal to keep you up-to-date with factual information regarding chemical storage, the best we can. US Chemical Storage provides useful information that can benefit you, your facility, and your community when storing hazardous chemicals. While this document may cover a number of important compliant hazardous chemical storage regulations, it cannot address every single situation for keeping hazardous chemicals fully compliant. Check with your State for documents that address compliant chemical storage solutions specific to the chemical you are storing. Employers or facilities that store 55 gallons or 500 pounds or more of any individual hazardous chemical as defined by the Occupational Safety and Health Act (OSHA), must design a Hazardous Substance list which should contain the appropriate chemical name, the quantity of the chemicals being stored, where the chemicals are stored, what temperature or pressure the chemicals should be stored at and the expiration date of the chemicals (if there is one). The Hazardous Substance List should be updated no less than annually. Employers must maintain an updated MSDS that is received from the manufactures or distributors for each hazardous chemical being stored. The employer that is storing chemicals can request a MSDS in writing from the manufacturer or distributor within 30 days after receipt of the hazardous material purchased. If the employer does not receive an MSDS within the 30 days of his/her request, he/she must notify the Commissioner of Labor that the manufacturer or distributor did not present the MSDS. Use a fully compliant chemical storage building that meets or exceeds all regulations.